Discuss heat transfer by radiation. Explain the power of different materials. You can feel the heat transfer from a fire and from the Sun. Similarly, you can sometimes tell that the oven is hot without touching its door or looking inside—it may just warm you as you walk by. The space between the Earth and the Sun is largely empty, without any possibility of heat transfer by convection or conduction. 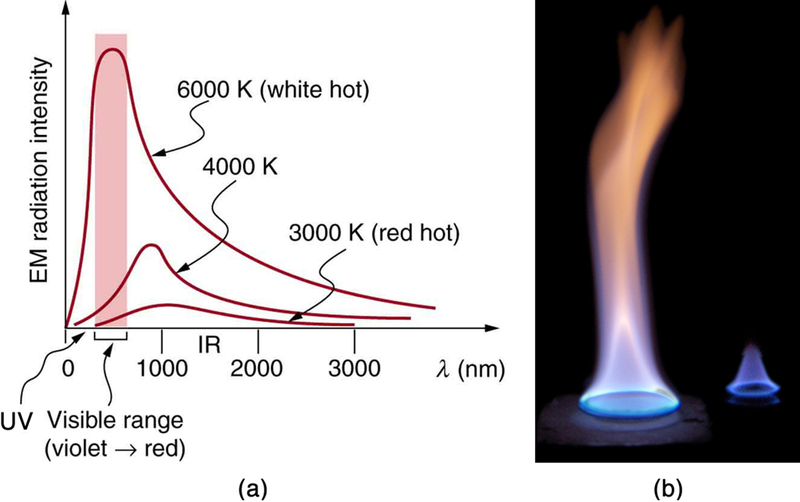 In these examples, heat is transferred by radiation. That is, the hot body emits electromagnetic waves that are absorbed by our skin: no medium is required for electromagnetic waves to propagate. Different names are used for electromagnetic waves of different wavelengths: radio waves, microwaves, infrared radiation, visible light, ultraviolet radiation, X-rays, and gamma rays. The energy of electromagnetic radiation depends on the wavelength (color) and varies over a wide range: a smaller wavelength (or higher frequency) corresponds to a higher energy. Because more heat is radiated at higher temperatures, a temperature change is accompanied by a color change. Take, for example, an electrical element on a stove, which glows from red to orange, while the higher-temperature steel in a blast furnace glows from yellow to white. The radiation you feel is mostly infrared, which corresponds to a lower temperature than that of the electrical element and the steel. The radiated energy depends on its intensity, which is represented in the figure below by the height of the distribution. Chapter 24 Electromagnetic Waves explains more about the electromagnetic spectrum and Chapter 29 Introduction to Quantum Physics discusses how the decrease in wavelength corresponds to an increase in energy. Figure 3. 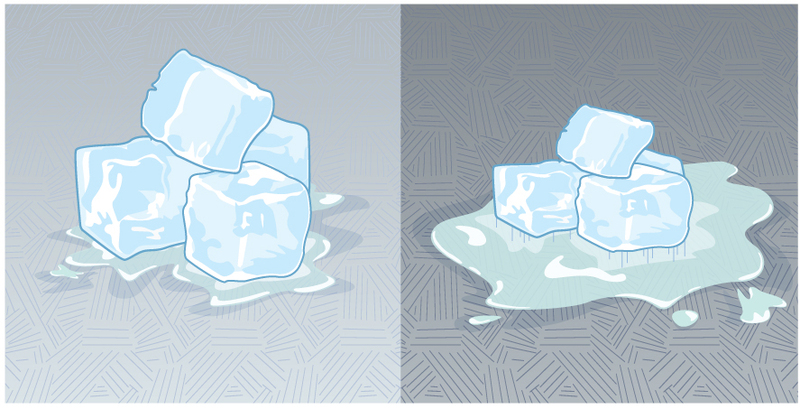 This illustration shows that the darker pavement is hotter than the lighter pavement (much more of the ice on the right has melted), although both have been in the sunlight for the same time. The thermal conductivities of the pavements are the same. Gray objects have a uniform ability to absorb all parts of the electromagnetic spectrum. Colored objects behave in similar but more complex ways, which gives them a particular color in the visible range and may make them special in other ranges of the nonvisible spectrum. Take, for example, the strong absorption of infrared radiation by the skin, which allows us to be very sensitive to it. Figure 4. A black object is a good absorber and a good radiator, while a white (or silver) object is a poor absorber and a poor radiator. It is as if radiation from the inside is reflected back into the silver object, whereas radiation from the inside of the black object is “absorbed” when it hits the surface and finds itself on the outside and is strongly emitted. The radiation rate is directly proportional to the fourth power of the absolute temperature—a remarkably strong temperature dependence. Furthermore, the radiated heat is proportional to the surface area of the object. 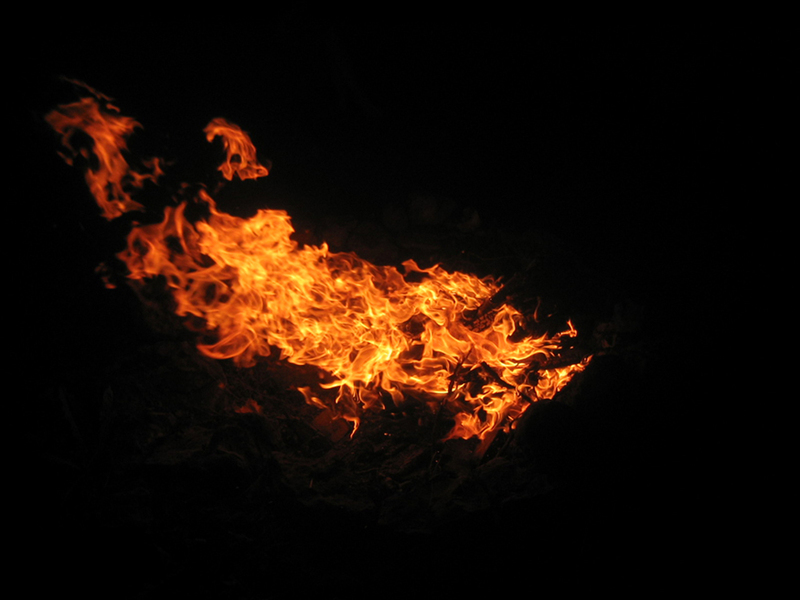 If you knock apart the coals of a fire, there is a noticeable increase in radiation due to an increase in radiating surface area. Skin is a remarkably good absorber and emitter of infrared radiation, having an emissivity of 0.97 in the infrared spectrum. Thus, we are all nearly (jet) black in the infrared, in spite of the obvious variations in skin color. This high infrared emissivity is why we can so easily feel radiation on our skin. It is also the basis for the use of night scopes used by law enforcement and the military to detect human beings. Even small temperature variations can be detected because of the dependence. Images, called thermographs, can be used medically to detect regions of abnormally high temperature in the body, perhaps indicative of disease. Similar techniques can be used to detect heat leaks in homes Figure 5, optimize performance of blast furnaces, improve comfort levels in work environments, and even remotely map the Earth’s temperature profile. where is the emissivity of the object alone. 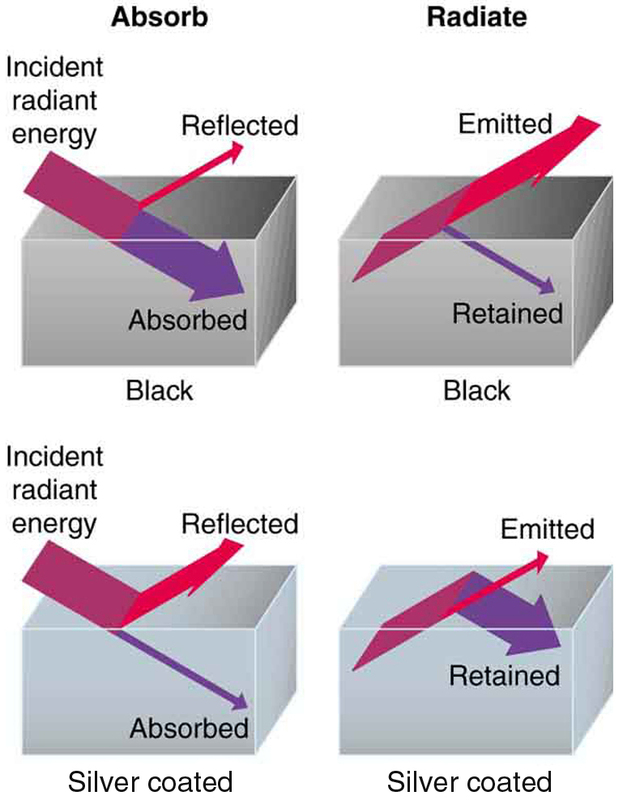 In other words, it does not matter whether the surroundings are white, gray, or black; the balance of radiation into and out of the object depends on how well it emits and absorbs radiation. When the quantity is positive; that is, the net heat transfer is from hot to cold. Place a thermometer out in the sunshine and shield it from direct sunlight using an aluminum foil. What is the reading? Now remove the shield, and note what the thermometer reads. Take a handkerchief soaked in nail polish remover, wrap it around the thermometer and place it in the sunshine. What does the thermometer read? What is the rate of heat transfer by radiation, with an unclothed person standing in a dark room whose ambient temperature is The person has a normal skin temperature of and a surface area of The emissivity of skin is 0.97 in the infrared, where the radiation takes place. We can solve this by using the equation for the rate of radiative heat transfer. This value is a significant rate of heat transfer to the environment (note the minus sign), considering that a person at rest may produce energy at the rate of 125 W and that conduction and convection will also be transferring energy to the environment. Indeed, we would probably expect this person to feel cold. Clothing significantly reduces heat transfer to the environment by many methods, because clothing slows down both conduction and convection, and has a lower emissivity (especially if it is white) than skin. The Earth receives almost all its energy from radiation of the Sun and reflects some of it back into outer space. Because the Sun is hotter than the Earth, the net energy flux is from the Sun to the Earth. However, the rate of energy transfer is less than the equation for the radiative heat transfer would predict because the Sun does not fill the sky. The average emissivity ( ) of the Earth is about 0.65, but the calculation of this value is complicated by the fact that the highly reflective cloud coverage varies greatly from day to day. There is a negative feedback (one in which a change produces an effect that opposes that change) between clouds and heat transfer; greater temperatures evaporate more water to form more clouds, which reflect more radiation back into space, reducing the temperature. The often mentioned greenhouse effect is directly related to the variation of the Earth’s emissivity with radiation type (see the figure given below). The greenhouse effect is a natural phenomenon responsible for providing temperatures suitable for life on Earth. The Earth’s relatively constant temperature is a result of the energy balance between the incoming solar radiation and the energy radiated from the Earth. Most of the infrared radiation emitted from the Earth is absorbed by carbon dioxide ( ) and water ( ) in the atmosphere and then re-radiated back to the Earth or into outer space. Re-radiation back to the Earth maintains its surface temperature about higher than it would be if there was no atmosphere, similar to the way glass increases temperatures in a greenhouse. Figure 6. The greenhouse effect is a name given to the trapping of energy in the Earth’s atmosphere by a process similar to that used in greenhouses. The atmosphere, like window glass, is transparent to incoming visible radiation and most of the Sun’s infrared. 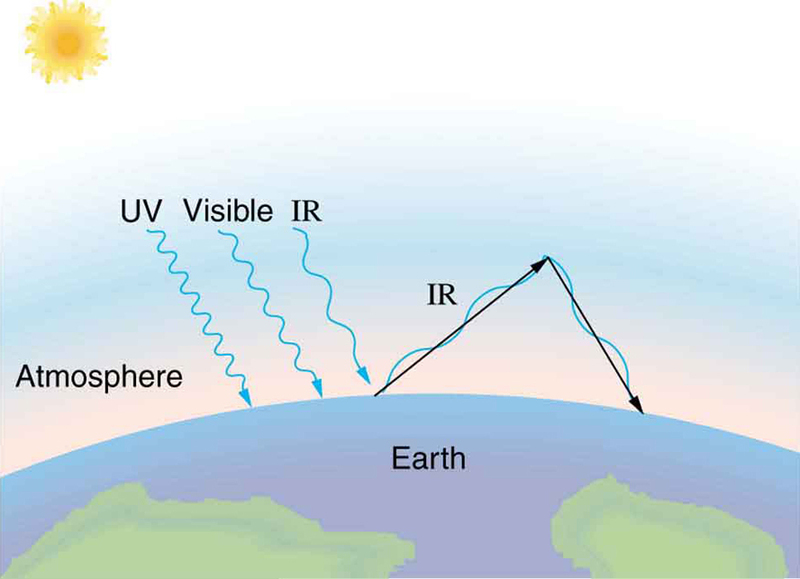 These wavelengths are absorbed by the Earth and re-emitted as infrared. Since Earth’s temperature is much lower than that of the Sun, the infrared radiated by the Earth has a much longer wavelength. The atmosphere, like glass, traps these longer infrared rays, keeping the Earth warmer than it would otherwise be. The amount of trapping depends on concentrations of trace gases like carbon dioxide, and a change in the concentration of these gases is believed to affect the Earth’s surface temperature. The greenhouse effect is also central to the discussion of global warming due to emission of carbon dioxide and methane (and other so-called greenhouse gases) into the Earth’s atmosphere from industrial production and farming. Changes in global climate could lead to more intense storms, precipitation changes (affecting agriculture), reduction in rain forest biodiversity, and rising sea levels. Heating and cooling are often significant contributors to energy use in individual homes. Current research efforts into developing environmentally friendly homes quite often focus on reducing conventional heating and cooling through better building materials, strategically positioning windows to optimize radiation gain from the Sun, and opening spaces to allow convection. It is possible to build a zero-energy house that allows for comfortable living in most parts of the United States with hot and humid summers and cold winters. Conversely, dark space is very cold, about so that the Earth radiates energy into the dark sky. Owing to the fact that clouds have lower emissivity than either oceans or land masses, they reflect some of the radiation back to the surface, greatly reducing heat transfer into dark space, just as they greatly reduce heat transfer into the atmosphere during the day. The rate of heat transfer from soil and grasses can be so rapid that frost may occur on clear summer evenings, even in warm latitudes. The cost of energy is generally believed to remain very high for the foreseeable future. Thus, passive control of heat loss in both commercial and domestic housing will become increasingly important. Energy consultants measure and analyze the flow of energy into and out of houses and ensure that a healthy exchange of air is maintained inside the house. The job prospects for an energy consultant are strong. Examine the situation to determine what type of heat transfer is involved. Identify the type(s) of heat transfer—conduction, convection, or radiation. Identify exactly what needs to be determined in the problem (identify the unknowns). A written list is very useful. For conduction, equation is appropriate. Table 3 lists thermal conductivities. For convection, determine the amount of matter moved and use equation to calculate the heat transfer involved in the temperature change of the fluid. If a phase change accompanies convection, equation or is appropriate to find the heat transfer involved in the phase change. Table 2 lists information relevant to phase change. For radiation, equation gives the net heat transfer rate. Insert the knowns along with their units into the appropriate equation and obtain numerical solutions complete with units. Check the answer to see if it is reasonable. Does it make sense? Radiation is the rate of heat transfer through the emission or absorption of electromagnetic waves. where is the temperature of an object surrounded by an environment with uniform temperature and is the emissivity of the object. 1: When watching a daytime circus in a large, dark-colored tent, you sense significant heat transfer from the tent. Explain why this occurs. 2: Satellites designed to observe the radiation from cold (3 K) dark space have sensors that are shaded from the Sun, Earth, and Moon and that are cooled to very low temperatures. Why must the sensors be at low temperature? 3: Why are cloudy nights generally warmer than clear ones? 4: Why are thermometers that are used in weather stations shielded from the sunshine? What does a thermometer measure if it is shielded from the sunshine and also if it is not? 5: On average, would Earth be warmer or cooler without the atmosphere? Explain your answer. 1: At what net rate does heat radiate from a black roof on a night when the roof’s temperature is and the surrounding temperature is The emissivity of the roof is 0.900. 2: (a) Cherry-red embers in a fireplace are at and have an exposed area of and an emissivity of 0.980. The surrounding room has a temperature of If 50% of the radiant energy enters the room, what is the net rate of radiant heat transfer in kilowatts? (b) Does your answer support the contention that most of the heat transfer into a room by a fireplace comes from infrared radiation? 3: Radiation makes it impossible to stand close to a hot lava flow. Calculate the rate of heat transfer by radiation from of fresh lava into surroundings, assuming lava’s emissivity is 1.00. 4: (a) Calculate the rate of heat transfer by radiation from a car radiator at into a environment, if the radiator has an emissivity of 0.750 and a surface area. (b) Is this a significant fraction of the heat transfer by an automobile engine? To answer this, assume a horsepower of and the efficiency of automobile engines as 25%. 6: Suppose you walk into a sauna that has an ambient temperature of (a) Calculate the rate of heat transfer to you by radiation given your skin temperature is the emissivity of skin is 0.98, and the surface area of your body is (b) If all other forms of heat transfer are balanced (the net heat transfer is zero), at what rate will your body temperature increase if your mass is 75.0 kg? 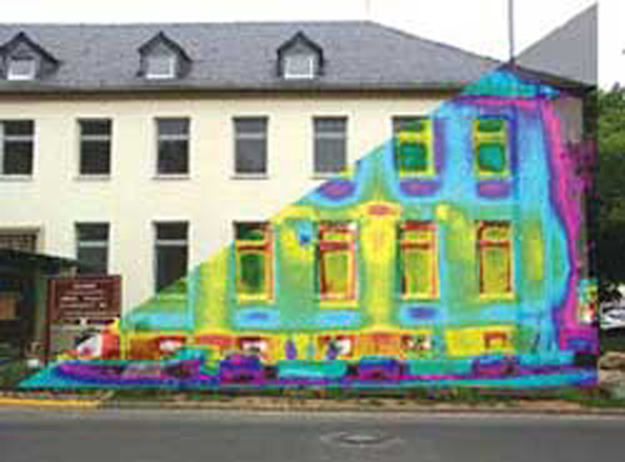 7: Thermography is a technique for measuring radiant heat and detecting variations in surface temperatures that may be medically, environmentally, or militarily meaningful. (a) What is the percent increase in the rate of heat transfer by radiation from a given area at a temperature of compared with that at such as on a person’s skin? (b) What is the percent increase in the rate of heat transfer by radiation from a given area at a temperature of compared with that at such as for warm and cool automobile hoods? Figure 8. 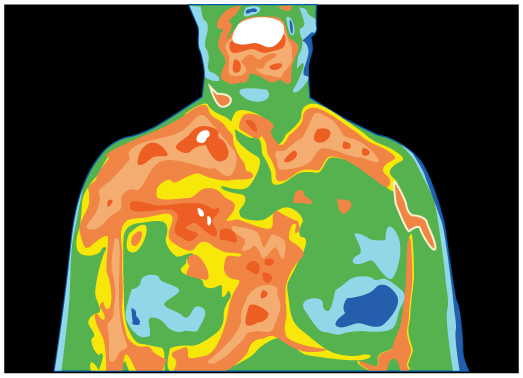 Artist’s rendition of a thermograph of a patient’s upper body, showing the distribution of heat represented by different colors. 9: A large body of lava from a volcano has stopped flowing and is slowly cooling. The interior of the lava is at its surface is at and the surroundings are at (a) Calculate the rate at which energy is transferred by radiation from of surface lava into the surroundings, assuming the emissivity is 1.00. (b) Suppose heat conduction to the surface occurs at the same rate. What is the thickness of the lava between the surface and the interior, assuming that the lava’s conductivity is the same as that of brick? 11: (a) A shirtless rider under a circus tent feels the heat radiating from the sunlit portion of the tent. Calculate the temperature of the tent canvas based on the following information: The shirtless rider’s skin temperature is and has an emissivity of 0.970. The exposed area of skin is He receives radiation at the rate of 20.0 W—half what you would calculate if the entire region behind him was hot. The rest of the surroundings are at (b) Discuss how this situation would change if the sunlit side of the tent was nearly pure white and if the rider was covered by a white tunic. One day the relative humidity is and that evening the temperature drops to well below the dew point. (a) How many grams of water condense from each cubic meter of air? (b) How much heat transfer occurs by this condensation? (c) What temperature increase could this cause in dry air? Large meteors sometimes strike the Earth, converting most of their kinetic energy into thermal energy. (a) What is the kinetic energy of a meteor moving at 25.0 km/s? (b) If this meteor lands in a deep ocean and of its kinetic energy goes into heating water, how many kilograms of water could it raise by (c) Discuss how the energy of the meteor is more likely to be deposited in the ocean and the likely effects of that energy. Frozen waste from airplane toilets has sometimes been accidentally ejected at high altitude. Ordinarily it breaks up and disperses over a large area, but sometimes it holds together and strikes the ground. Calculate the mass of ice that can be melted by the conversion of kinetic and gravitational potential energy when a piece of frozen waste is released at 12.0 km altitude while moving at 250 m/s and strikes the ground at 100 m/s (since less than 20.0 kg melts, a significant mess results). (a) A large electrical power facility produces 1600 MW of “waste heat,” which is dissipated to the environment in cooling towers by warming air flowing through the towers by What is the necessary flow rate of air in (b) Is your result consistent with the large cooling towers used by many large electrical power plants? (a) Suppose you start a workout on a Stairmaster, producing power at the same rate as climbing 116 stairs per minute. Assuming your mass is 76.0 kg and your efficiency is how long will it take for your body temperature to rise if all other forms of heat transfer in and out of your body are balanced? (b) Is this consistent with your experience in getting warm while exercising? A 76.0-kg person suffering from hypothermia comes indoors and shivers vigorously. How long does it take the heat transfer to increase the person’s body temperature by if all other forms of heat transfer are balanced? In certain large geographic regions, the underlying rock is hot. Wells can be drilled and water circulated through the rock for heat transfer for the generation of electricity. (a) Calculate the heat transfer that can be extracted by cooling of granite by (b) How long will it take for heat transfer at the rate of 300 MW, assuming no heat transfers back into the of rock by its surroundings? 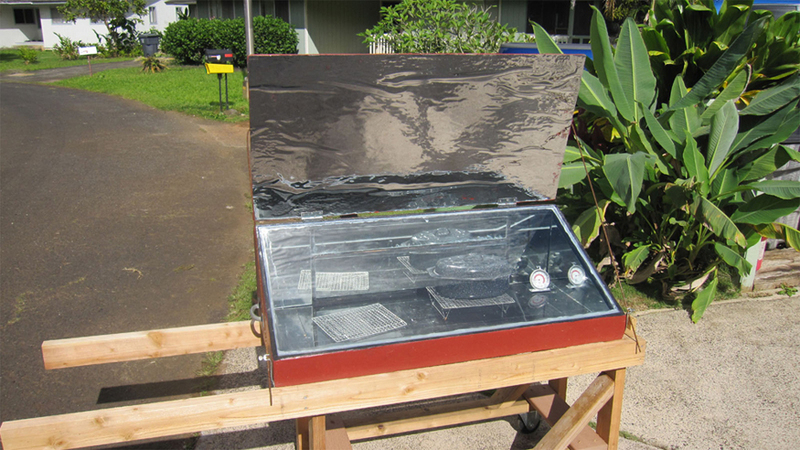 Heat transfers from your lungs and breathing passages by evaporating water. (a) Calculate the maximum number of grams of water that can be evaporated when you inhale 1.50 L of air with an original relative humidity of 40.0%. (Assume that body temperature is also (b) How many joules of energy are required to evaporate this amount? (c) What is the rate of heat transfer in watts from this method, if you breathe at a normal resting rate of 10.0 breaths per minute? (a) What is the temperature increase of water falling 55.0 m over Niagara Falls? (b) What fraction must evaporate to keep the temperature constant? Hot air rises because it has expanded. It then displaces a greater volume of cold air, which increases the buoyant force on it. (a) Calculate the ratio of the buoyant force to the weight of air surrounded by air. (b) What energy is needed to cause of air to go from to (c) What gravitational potential energy is gained by this volume of air if it rises 1.00 m? Will this cause a significant cooling of the air? (a) What is the temperature increase of an 80.0 kg person who consumes 2500 kcal of food in one day with 95.0% of the energy transferred as heat to the body? (b) What is unreasonable about this result? (c) Which premise or assumption is responsible? A slightly deranged Arctic inventor surrounded by ice thinks it would be much less mechanically complex to cool a car engine by melting ice on it than by having a water-cooled system with a radiator, water pump, antifreeze, and so on. (a) If of the energy in 1.00 gal of gasoline is converted into “waste heat” in a car engine, how many kilograms of ice could it melt? (b) Is this a reasonable amount of ice to carry around to cool the engine for 1.00 gal of gasoline consumption? (c) What premises or assumptions are unreasonable? (a) Calculate the rate of heat transfer by conduction through a window with an area of that is 0.750 cm thick, if its inner surface is at and its outer surface is at (b) What is unreasonable about this result? (c) Which premise or assumption is responsible? A meteorite 1.20 cm in diameter is so hot immediately after penetrating the atmosphere that it radiates 20.0 kW of power. (a) What is its temperature, if the surroundings are at and it has an emissivity of 0.800? (b) What is unreasonable about this result? (c) Which premise or assumption is responsible? Consider a new model of commercial airplane having its brakes tested as a part of the initial flight permission procedure. The airplane is brought to takeoff speed and then stopped with the brakes alone. Construct a problem in which you calculate the temperature increase of the brakes during this process. You may assume most of the kinetic energy of the airplane is converted to thermal energy in the brakes and surrounding materials, and that little escapes. Note that the brakes are expected to become so hot in this procedure that they ignite and, in order to pass the test, the airplane must be able to withstand the fire for some time without a general conflagration. Consider a person outdoors on a cold night. Construct a problem in which you calculate the rate of heat transfer from the person by all three heat transfer methods. Make the initial circumstances such that at rest the person will have a net heat transfer and then decide how much physical activity of a chosen type is necessary to balance the rate of heat transfer. Among the things to consider are the size of the person, type of clothing, initial metabolic rate, sky conditions, amount of water evaporated, and volume of air breathed. Of course, there are many other factors to consider and your instructor may wish to guide you in the assumptions made as well as the detail of analysis and method of presenting your results. 1: The radiated heat is proportional to the fourth power of the absolute temperature. Because and the rate of heat transfer increases by about 30 percent of the original rate. Note that the negative answer implies heat loss to the surroundings. (b) A pure white object reflects more of the radiant energy that hits it, so a white tent would prevent more of the sunlight from heating up the inside of the tent, and the white tunic would prevent that heat which entered the tent from heating the rider. Therefore, with a white tent, the temperature would be lower than and the rate of radiant heat transferred to the rider would be less than 20.0 W.
(c) When a large meteor hits the ocean, it causes great tidal waves, dissipating large amount of its energy in the form of kinetic energy of the water. (b) This is equivalent to 12 million cubic feet of air per second. That is tremendous. This is too large to be dissipated by heating the air by only Many of these cooling towers use the circulation of cooler air over warmer water to increase the rate of evaporation. This would allow much smaller amounts of air necessary to remove such a large amount of heat because evaporation removes larger quantities of heat than was considered in part (a). (c) The assumption of heat retention is unreasonable. (b) Very high power loss through a window. An electric heater of this power can keep an entire room warm. (c) The surface temperatures of the window do not differ by as great an amount as assumed. The inner surface will be warmer, and the outer surface will be cooler. 14.7 Radiation by OpenStax is licensed under a Creative Commons Attribution 4.0 International License, except where otherwise noted.